April, 2019 the Studio and Gallery will be open from Wednesday thru Saturday, 10 a.m. to 4 p.m.
Beginning weaving classes will be scheduled every month in 2019. April 17 – 19. The three day class is for the beginning weaver and the weaver wishing to re-acquaint themselves with forgotten skills. Materials and tools are included. Expect to design, set-up, and weave off a project of your choosing. Cost for the three day experience is $225.00. Participants are encouraged to bring a lunch. Call Gretchen at, 508-229-3992 if interested in joining us. Weavers of all skill levels are welcome to book a one, two, or three day weaving focus session to work on a particular structure or fiber that has been of interest to the weaver. Four to twelve shaft jack, counterbalance, and counter marche loom types are available to use. Wool, cotton, linen, and synthetic fibers are on hand to use. The weaver is supported and mentored during the design, set-up, and weaving processes. 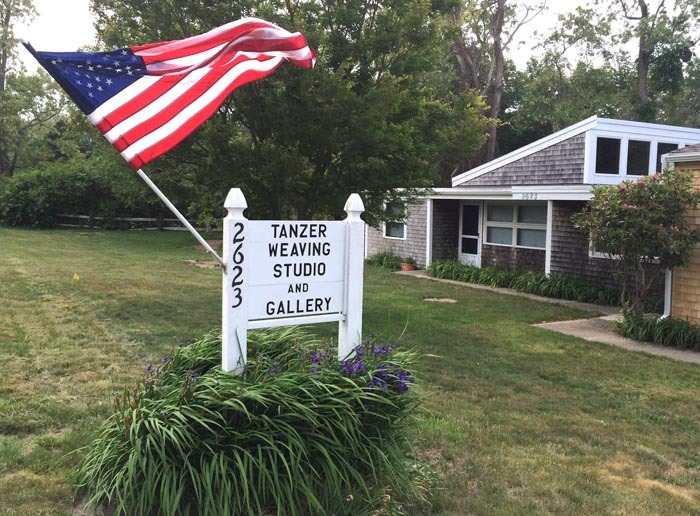 Tanzer Gallery and Weaving Studio, #2623 Main Street (Rt. 6A) Brewster. If the American flag is up, we are open! Check out the summer class offerings or choose to work independently. Open year round, 4 days per week in the winter and spring, 5 days per week in the summer and fall.